Backup File Is Unusable, when you attempt to restore windows backup data. [Unrecognized Media] The backup file is unusable. You must erase it, or choose another file. No special technical skills are necessary. Software provides find features for searching particular files. No limit of file size to repair & restore files from backup. Software allows complete preview of corrupt backup files before saving. Software provides 3 advance scanning mode: Quick, Deep & Range Based Scan. Software provides extract backup files feature. Safely repair & restore files from backup created with Windows 98, NT, 2000, XP, 2003, Vista, Windows 7 & Windows 8. Demo version of the Windows backup file restore software will provide you complete preview of the repair Windows backup file items but you cannot save the files from backup using with demo version. If you want to restore windows backup data in their machine then you have to go with full version license. "Thanks for the immense support & effective product which helped to restore files from backup. 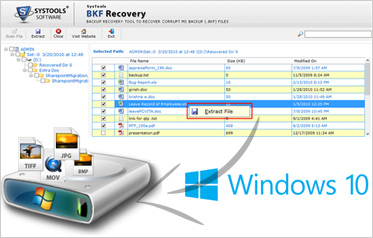 Windows backup recovery was not sured in beginning but in the end, it is done successfully due to the effectiveness of backup file restore tool."